For those of you who have read the Muvo project pages this article takes a similar approach to solving the long term issues of battery consumption on a wireless multimedia keyboard. As it happened this keyboard set, purchased from Tesco’s a year ago had been doing sterling service but with a few operational gripes. The bottom right hand shift key was the only shift key that worked but it was not reliable. The battery door kept falling off. There was no positive clip home and eventually the door would not stay put. 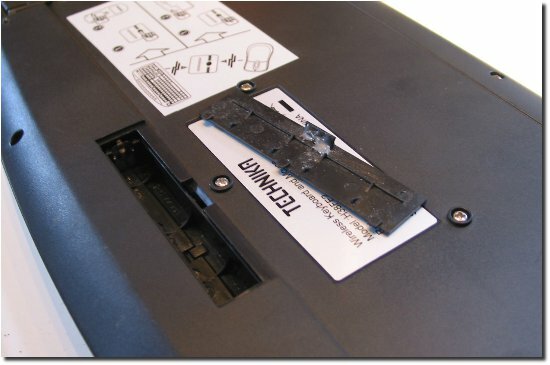 Without the door in place there was nothing to stop the battery falling out just enough to stop the keyboard working. 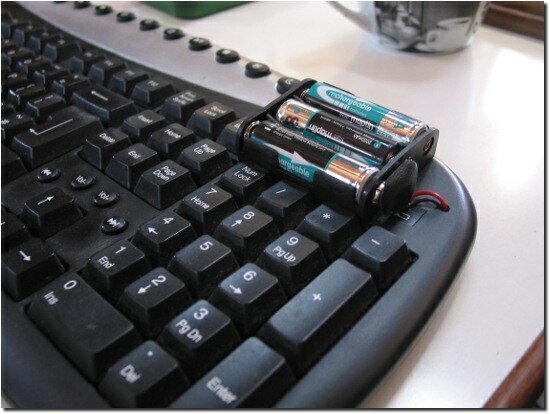 Sometimes when moving the keyboard the battery would fall completely out. These issues would normally be enough to convince anyone, myself included, it was time to buy another keyboard and mouse set. After all, what do you expect for £12.99 these days? But look, its me, and I guess this product just leapt at me as another example of Designed for landfill. Plus of course, at the time there was no advantage in buying another keyboard – the new keyboard would similarly suffer in the same way as this one. I hear on the news there are now 2.5 million unemployed and I am sure some of them will be in watching their pennies. Therefore I decided to post this to show one method of solving this problem. Using some Selotape or similar could be used. However over time I could see this ending up in a sticky mess and it still left me with having to buy batteries. It didn’t strike me as a very elegant solution since it was more of patching over the problem rather than engineering a solution. Instead my initial efforts to fix the battery door turned instead to a hot glue gun. The idea was to run a strengthening bead of glue to reinforce the ‘friction edge’ that had been unsuccessful in keeping the door shut. The results were less than ideal and it fell off within minutes. What I began to put together was stimulated by the information provided on the information sticker on the reverse of the unit. The sticker read 5 Volts. As supplied the unit ran off 2 AA batteries giving around 3 volts, more realistically 3.2 volts from a new pair of dry cell batteries, it was quite likely this was only marginally above the units minimum usable voltage. By measuring the voltage of the duff batteries that came out of the unit, their terminal voltage was around 1.4 volts, giving an all up dead voltage of 2.8 volts. That’s only .4 of a volt between new and working and non working and dead. Doesn’t seem much does it. I began to see that this Keyboard manufacturer probably had financial shares in a dry cell battery manufacturer as the product really didn’t seem to care about getting the most from them. Three batteries would have been a better but the unit was only designed for two. Perhaps when you realise they may have sold 100,000 of these units, that’s a saving of having to include an extra 100,000 extra AA cells, which could easily amount to their profit or loss at the end of the day for the manufacturer and as we see in this day and age who cares about the consumer? Let him buy them by the dozen – look at the share price rise! It is easy to see the cunning plan of the manufacturer. By having a weakly designed battery door supported by a design that necessitated frequent battery changes, the stage is set for a product of short life span before the consumer mode kicks in, and your left to go and buy another and deposit this one into the big land fill bucket simply because the product design capitalises on the weak design of the door. A three cell AA battery holder would give a terminal voltage with dry cells of around 1.6 x 3 = 4.8 volts. Just under the 5 volt rating – assuming of course the unit was designed for 5 volts. It could have been designed for 3.3 volts or even 3 volts. I had no real idea other than the information on the sticker, and the 5 volts might have referred to the USB receiver part. I determined it was worth the risk because there were fairly serious niggles with the unit and this would do or die it as a solution. As a fall back plan should I have killed the Keyboard I’d have gone and bought another and accept that my effort to make it better was its final undoing. A replacement would obviously fix the Shift Key issue and part of the £12.99 purchase price would have been offset as the unit came with batteries anyhow. The battery door issue I am sure would return in time. As luck would have it, being a subscriber to Maplin’s mailing list, on the week that I needed it, Maplin’s came up with a rechargeable mains adaptor complete with 4 AA batteries on sale for £7.99. Not only this but the rechargeable batteries were on sale for a pack of 10 for £9.99. As I was going to buy new batteries anyhow which would have amounted to at least £10, don’t forget this needs AA and AAA for the keyboard and mouse, this looked like a worthwhile opportunity. Yes the whole thing was becoming way more expensive than simply buying dry cells but over time it was easy to see the savings besides which having the batteries made them available for other applications. Which is rather a lot to run a keyboard and mouse. Of course I could have returned to using a wired mouse and keyboard but it is so much more convenient to use wireless. This is what it cost me then, £27,87 compares to how many dry cells with one time use could I have got for that? The AAA batteries? These are used by the mouse. There isn’t really room in the mouse to fit two AA batteries although I have considered it. They may go, it just requires major surgery and I didn’t feel I needed it. These are workable solutions here and no doubt would last a considerable length of time. It would add considerably to the weight of the keyboard. I decided against this as a solution particularly as I was going for a re-chargeable option. The reason for this latter option because I am not electrically poor being supported by the National Grid. Not with standing this the extra weight of three C cells adds up against what is a very light weight mobile keyboard. In terms of a pushed into it financially situation where minimum initial spend and maximum life were required, Dry C or D Cells are the only option. This would undoubtably result in the best cost/ performance solution. D cells would be excellent bar their baulk. You would need to purchase single C or D cell holders and line them up in series above the F keys and below the multimedia keys at the top. They will need to be wired in series in a line and securely glued or mounted to the keyboard. Exactly as predicted by the virtue of having a quantity of rechargable batteries I am having to remember to charge them, remember to take them off charge after a suitable time. Plus I have to store them and to this end I purchased some plastic boxes designed for these types of batteries. A simple system has been implemented – if the positive terminal is to the left they are flat and need recharging. If the positive end is to the right they are charged. The few pounds it cost for these storage boxes is easily worthwhile since it keeps the batteries in one place and stops them from being lost by sliding down the back of things or ending up dumped in little containers where you’ve no idea if its charged or not. The keyboard operates for far longer between battery changes on the three cell solution. Its probably once per month the batteries are changed with use everyday of several hours. The mouse begins to pulse its red LED sensor light when the batteries are exhausted about every .25 seconds. In summary the most obvious solution of using some sticky tape to hold the battery door on is the quickest fix but did nothing to solve the inherit flaws of the product. The C or D cell modification would offer the best cost/ performance returns but at the expense of added bulk to the product. If this was not an issue then this is the best solution. Where portability is required, the rechargeable battery solution seems the best option. It would even be a suitable where AA dry cells are used saving the cost of rechargeable cells but still necessitating the continued purchasing of replacement AA batteries. Tagged Homebrew, Product modification. Bookmark the permalink.